Make sure you know how to get back to where you are staying!! 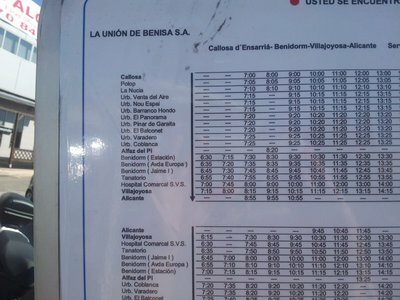 ...however, 40 mins later after passing through the town centre of La Nucia with no sign of anything we recognised the bus terminated at Callosa and we realised something had gone very wrong! ...however, it was an hours wait until the next bus and then a tense 30 mins of playing guess the bus stop as we were not 100% sure exactly where we were going, but fortunately we finally saw the local Mercadona so frantically jumped off the bus before heading home.